Thousands of visitors thronged to Westmoreland Park on Sunday, September 24th, to explore the fourth annual "Salmon Celebration" there. Many area streets were blocked off to accommodate bike riders who were part of the concurrent Sunday Parkways walk and ride, and with sunny weather, spectators arrived in droves. The Salmon Celebration is a community gathering along the banks of Crystal Springs Creek in the popular park – to welcome the return of salmon to Portland coming up the Willamette River, turning at Johnson Creek, and turning again on Crystal Springs Creek. Inner Southeast provides the last undammed, unpiped salmon-bearing watershed in the city, terminating at the lake at Reed College. The celebration in the park this year included a Native American blessing, a salmon bake demonstration – not cooking the very salmon returning to spawn! – plus games, crafts, and inter-tribal activities, to help educate people about this historically important food source. Clifton Bruno and his Wasco Tribe family demonstrated how to prepare silver salmon for stretching and baking on sticks over an open fire. Free samples were given to visitors, along with information on preparing salmon-head soup and other Native American foods. Bruno said, "This event was set up when Portland's Native American Community Advisory Council suggested a salmon celebration at the park, which corresponded with the City's reopening of the renovated park, and of its new Nature Play area." Native American storyteller Ed Edmo, raised at Celilo Falls along the Columbia, recited origin tales, together with other storytellers and singers. Many of the tales include "the trickster, Coyote", giving insight on how early area residents explained and made sense of what they found in their world. The celebration involved many agencies and organizations, including Portland's Bureau of Environmental Services, Portland Parks & Recreation, National Wildlife Federation, SMILE, the Columbia River Intertribal Fish Commission, and the Crystal Springs Partnership, all of whom worked together to educate the public about stewardship of the Crystal Springs watershed to maintain a vibrant and healthy place for both people and wildlife. Representatives of many Native American Tribes explained how early people gathered & prepared foods and demonstrated harvesting lampreys, weaving fish traps, and making bracelets to honor the salmon life cycle. The U. S. Fish & Wildlife Service was there too, displaying a salmon poster, and demonstrating salmon internal anatomy with a large cloth puppet. 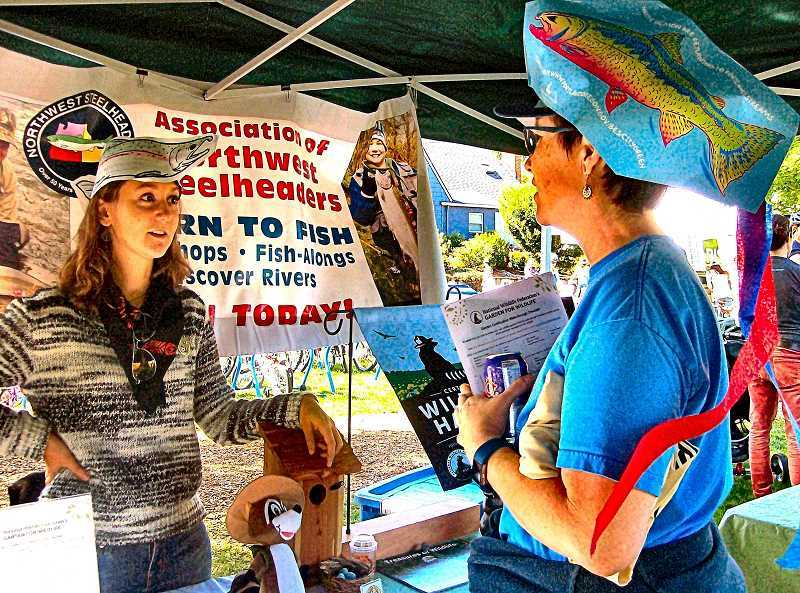 Many visitors created salmon hats and artwork to honor this historic local resource, before the sunny afternoon in Westmoreland Park came to an end.